Get to know Eurofins Genomics. We are introducing our experts! 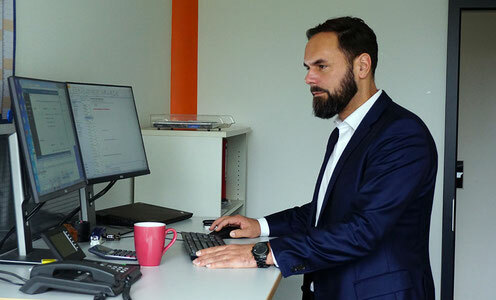 This edition introduces Dr Thomas Brefort, who manages the next generation sequencing business unit at Eurofins Genomics and who is the Managing Director of Eurofins Genomics Europe Sequencing GmbH. Hi Thomas, welcome to the interview. Tell us a little bit about you. How long have you been working for Eurofins Genomics? I work for Eurofins Genomics since 2015. I hold a Ph.D. degree in molecular biology, molecular genetics and biochemistry from the Max Planck Institute for Terrestrial Microbiology in Marburg, Germany. Here, I also stayed for my Postdoc and did research in Ustilago maydis, a fungal plant pathogen. We were interested in the plant-microbe interaction, how the fungus establishes on the plant, and how it induces tumours. We looked at highly conserved MAP Kinase pathways that also play a role in human carcinogenesis. I advanced my work as a Project Leader at the MPI, where my team and I investigated fungal effectors and how they impact on the host plant. At this point you seemed to have decided to take a shot at the industry. Yes, I had to make the decision on whether to stay in academia or to explore a career in the industry with a business aspect. Eventually, I took a position at Febit Biomed GmbH that worked with in-house manufactured microfluidic microarrays, including synthesising and analysing instruments. As the Director Application Development, I was responsible for the integration of detection methods and array-based target capture for next generation sequencing. The combination of applied science, engineering and economy was the crucial factor for my decision. This combination has kept its exciting promise to me… the question of what is applicable and marketable I never regretted my decision to venture into the industry. In 2011, we transformed Febit Biomed GmbH into the Comprehensive Biomarker Center (CBC). We focussed the company on our microRNA expertise and IP portfolio to build microRNA signature based liquid biopsy diagnostics and offered services. As the Vice President Biomarker Development and later Chief Technology Officer I oversaw all lab service and development activities, and facilitated customer, as well as investor relations. In 2015, I took the opportunity to join Eurofins Genomics as the manager for the next generation sequencing business unit. Why did you decide to work for Eurofins Genomics? Eurofins Genomics has a very broad product portfolio with defined business units, for example Sanger Sequencing and oligonucleotides. I saw the chance to contribute to the company with my experience and competence in most of the applied molecular biology areas. Of course, there is also my personal development. I was seeking to increase my experience, especially in the business administration part, as a great additional qualification. So far, it has worked out nicely for me. A great development career-wise and personally. That is an impressive career. What is the key to your success? That’s an interesting question and not easy to answer. I would venture to say that I am quite good in molecular biology. So, first and foremost, it is competence. I learned a lot at the MPI and, of course, during my university studies… and I retained that knowledge. I think this is the decisive factor for the tasks I do every day and why I can do them so well. The other key is enthusiasm and excitement, as well as my continuing and honest deep passion for molecular biology. The combination of high-tech and molecular biology is just awesome. I think people can feel my enthusiasm and that it is real, that it is authentic. This is very important to motivate people and to convince them to act together in order to achieve a common goal. What are your responsibilities at Eurofins Genomics? 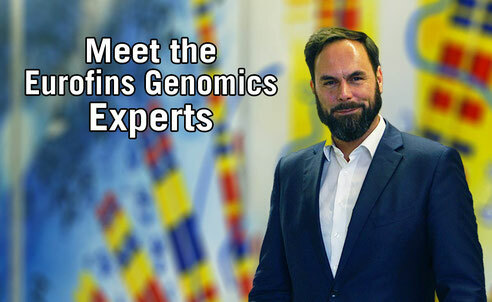 I took over the additional responsibility as Managing Director of Eurofins Genomics Europe Sequencing GmbH. So, I have the honour to be jointly responsible for the great team in Constance, Germany. In general, I ensure the effective and smooth cooperation between the different teams, so we as a company can provide the best possible services and products in the field of next generation sequencing. This includes the establishment of defined processes, but also the optimisation of processes in the lab, which allows us to provide the results faster with the same resources. A very exciting part is the development of new products together with the excellent R&D team. The world of genomics is moving fast and there are many great opportunities to grow and keep our product portfolio attractive to our customers. What is your vision for Eurofins Genomics’ NGS business unit? A lot of things will happen in the field of genomics in 2019. I have the impression that much has happened already during the first weeks and months of this year. The public understands more and more about the benefits and valuable insights that have been gained by genomics and next generation sequencing studies… for the treatment of diseases, but also for the health, food and agricultural sectors. Our aspiration is to translate this change into new products. We have the opportunities and means to combine biological questions, big data and bio-IT to create extremely exciting products and solutions. We get a lot of requests for different direct-to-consumer services and we are working on the realisation to provide a growing portfolio of these. Microbiome profiling, for example, is applicable in medicine, agriculture and biotech, but will also be available directly for consumers. In terms of health care or ancestral heritage, we will offer direct-to-consumer products. There are exciting times ahead. Indeed. Even though it might sound overly emotional, but we are in the age of molecular biology… and we can actively contribute to shaping this age. That’s incredible! And that’s what we are doing! A lot of work can mean a lot of stress. How do you manage to keep your cool when it gets stressful? The honest answer is: I don’t manage to keep my cool all the time, but most of the time. I think I owe this to my fantastic team and to the realisation that I can’t do everything on my own. I do a lot of things, but with increasing responsibilities and pressure, I realised it is best to trust my team and to delegate responsibilities into the right hands. I know my team and I know who is best suited for specific areas. This gives me the space to concentrate on the task that I need to do. Smart delegation to a great team is a major factor for me to stay cool and focused. The other major factor is definitely my family. My wife shows a great understanding, for which I am extremely grateful. I should tell her more often, though. And my two children, they are fantastic. It is great to see them growing up. Being home helps me tremendously to relax. My family is much more important to me than ongoing most difficult negotiations or other issues. What work advice would you give others? Prioritise and delegate! If you like to take on responsibility, you could tend to delegate less even though you have a great team. Here it is important to realise that you have good people and that it is smart to put trust in them, to know exactly who can take over certain tasks. Secondly, prioritise. Determine what the most important task is. What needs to be done immediately by yourself, and what can be done later without causing problems? Let’s get to know a little more about you. What’s your morning routine? How do you start into your day? Too slow… with coffee, but still too slow. I am not a morning person, I never was. I need some time to gathering momentum in the morning. In the morning I visualise my to-do list for the day and mentally prepare for the tasks and discussions. Overall, nothing fancy. Besides spending time with your family, what are you doing in your spare time? In Constance, I tend to work later, since my family is not waiting for me. I go out with colleagues to a beer garden in summer, or have a swim in the Rhine and Lake Constance. During the winter months, I go to the city centre but mostly to get something to eat and stretch my legs. At home, my wife and I meet with friends and go out. Our children are at an age now where this is more and more possible again. I also like to read books. So no “Molekulare Genetik” by Rolf Knippers? No, I still know it by heart… just kidding. I like to read sci-fi or high-tech thrillers before going to sleep. What is something others do not know about you but would be surprised if they knew? In school, I used to be really bad in sports. I look more athletic than I really am. I do not work out as much as I probably should, but I look like I would. I am fortunate in this regard. Nevertheless, I started to do my bodyweight exercises like push ups and squats more regularly again, as well as some cycling since beginning of the year. I try to work out every other day. Thank you for giving us a little insight into your work and your life. You are welcome. It has been fun.